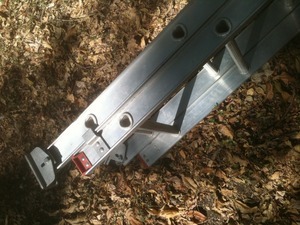 13 Ft. Multi Position Aluminum Ladder This multi-position ladder features four true functions. 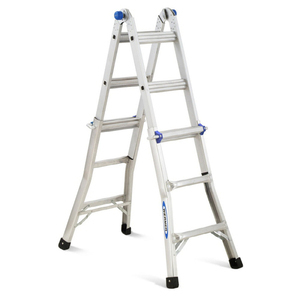 They are as follows 1) Super sturdy extension ladder 2) Multiple height scaffold 3) Adjustable height 2- Sided step ladder 4) Versatile stairway ladder. 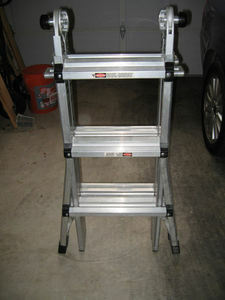 Heavy-duty aluminum construction. Superior locking hinge system. 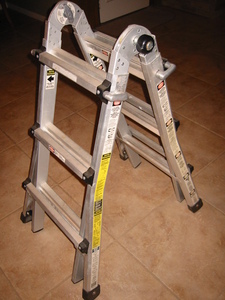 Flared base provides extra stability. 300 lb. Duty rating, ANSI Type IA. 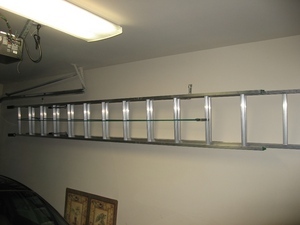 Assembled Depth (In Inches) 23.75 In. 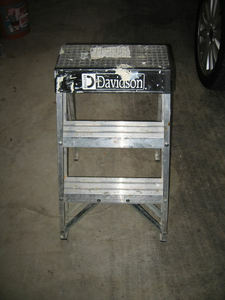 Assembled Height (In Inches) 8 Assembled Weight (In LBS) 35.8 Assembled Width (In Inches) 45.5 Base Spread (In.) 38.75 In. Base Width (In.) 23.75 In. Ladder Length (Ft.) 13.0 Ft.